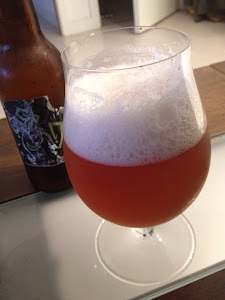 I was lucky enough to be handed a bottle of pre-production Double Joker IPA from Williams Brothers when at EBBC earlier this year. As you can see by the state of the label this was a hand bottled version, which had been sat in an ice bucket, so please ignore the bottles aesthetics. What's important is the beer inside. I'm reliably informed by one or two beer buddies that if you can find it, the regular Joker IPA is very good indeed on cask, but I must admit I find it a little lack lustre in the bottle. It just doesn't have the level of hop flavour that I look for in an IPA, and despite being a solid, drinkable beer it just misses the mark slightly. Double Joker however is a whole different story, at 8% and hopped to hell it certainly delivers on the hop front. The aroma is lightly sweet with orange and sweet pine resin in the fore and a little citrus floating up from the background. The flavour is very classic American IPA in style (in the bittersweet sense, rather than simply a beer with American hops in it). Sweet candy malt lays the base for hops to run riot, with loads of bitter blood orange and a touch of pine resin in the finish. It's wonderfully clean and balanced and reminds me a little of Odell IPA which is a hefty compliment. This actually tasted better after a few months in the bottle in my opinion, more complete and rounded than the last time I tasted it at EBBC. I hope they put this beer into production, it's a little cracker.